While the home’s simple, boxy forms starkly contrast with surrounding residences, its compact shape and modest scale help it fit into the traditional neighborhood without calling attention to itself. The house was built around a large birch tree, with dwarf fountain grass and porcupine grass planted in front. A weeping blue atlas cedar provides a focal point near the front door. The Passive House-certified home features high levels of insulation and high-performing, triple-glazed windows from Zola European Windows and Doors. Ample south-facing glazing is enhanced by exterior motorized aluminum shades, which can be lowered to block unwanted summer sun. A mahogany deck, finished with Penofin penetrating oil, hosts cafe chairs and a red table from Design Within Reach. The double-height living room features an Eames Molded Plywood lounge chair and coffee table. A Neo Chaise Sectional sofa by Bensen sits near a floor covering bought at Christiane Millinger Oriental Rugs. A green laminate countertop by Abet Laminati is surrounded by Norman Foster’s Emeco 20-06 counter stools in the kitchen, which includes a Frigidaire induction range, Faber Cylindra Isola range hood, Blomberg dishwasher, Fisher & Paykel fridge, and flat-grain fir plywood cabinets by Portland craftsman Doug Chamblin. A Louis Poulsen PH 5 pendant illuminates a Modernica Tenon Table and Eames Molded Plastic chairs with Eiffel bases. A George Nelson Ball Clock hangs nearby. Mahogany flooring, a continuation of the mahogany backyard deck and front porch, is enhanced with a clear finish. Vintage suitcases sit near rough sawn cedar walls, which are finished with an ebony stain. In the bathroom, plywood cabinets by Doug Chamblin support a concrete countertop Stern designed himself. A Toto toilet, Americh tub, Duravit sink, and Danze Parma faucet round out the space. Using scrap material from the kitchen cabinets and island, Stern and Chamblin created custom bedside tables that support a lamp by Seattle designer Brent Markee. The home’s open floor plan is exemplified by the loft-like master suite that looks out onto the backyard through a double-height living room. Sliding pocket doors and windows (invisible here), allow for privacy and separation when desired. After years of working from their home in Portland, Oregon, architect Jeff Stern and his wife, a felt artist, decided to build a house that better suited their lifestyle. The couple envisioned a modern, energy-efficient residence. “Since I was the architect, general contractor, certified Passive House consultant, and owner, I was able to tune the design for optimized performance and keep things simple,” says Stern, founder of In Situ Architecture. 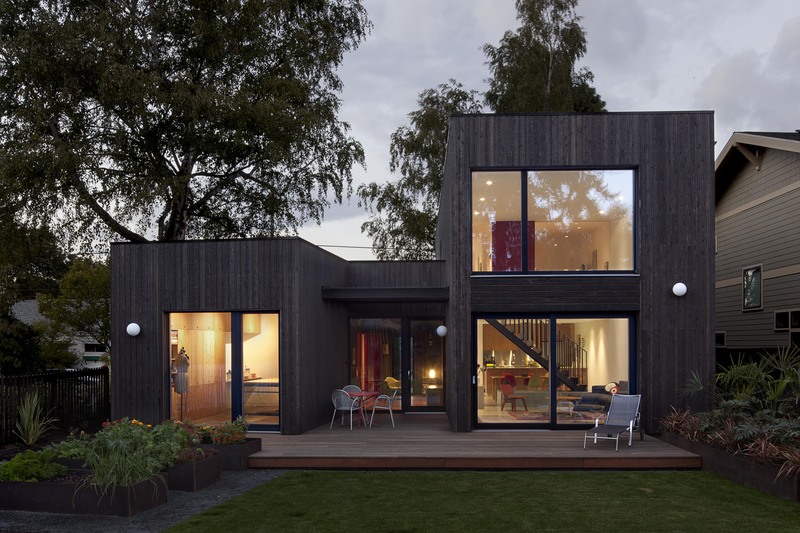 Built on an oversized lot the couple already owned, the Skidmore Passivhaus physically connects a detached studio and residence while maintaining a feeling of passing through outdoor space. The dark-stained, rough-sawn cedar siding's appearance will change naturally over time—a nod to traditional Northwest architecture. The home’s open floor plan is enhanced by cost-effective materials like painted sheetrock, concrete floors, and plywood cabinets. Brightly painted doors and laminate countertops provide splashes of color throughout the Passive House–certified residence, which produces nearly all of its electricity via a small, roof-mounted photovoltaic array.